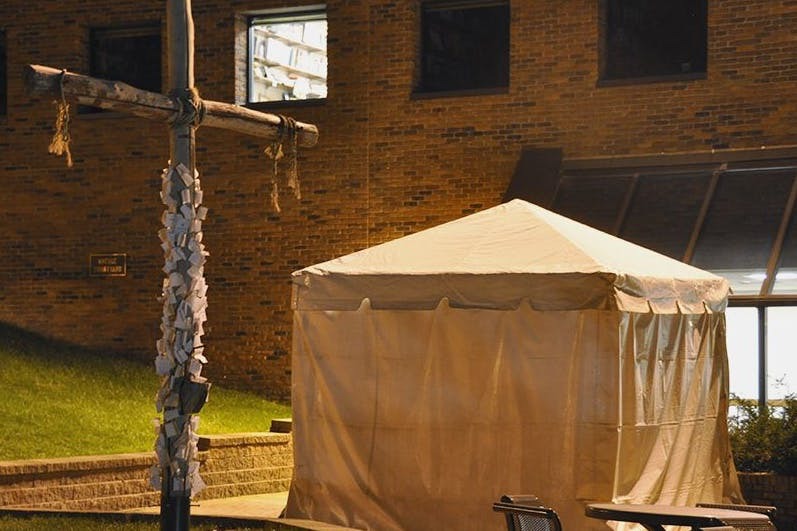 March 30, 2016 | 11 a.m.
A prayer tent constructed in Kresge Courtyard in 2011 with prayer requests nailed to a cross. Lars Anderson ’17 is majoring in finance and marketing, plays baseball, and leads a YoungLife ministry group for youth at Mounds View High School, located near Bethel’s campus. He’s also got a passion for prayer, which has brought about an ambitious student-led initiative on campus. 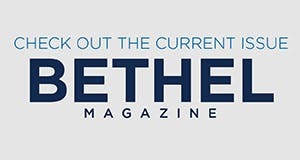 Anderson and a group of friends—with some oversight from the campus ministries staff—are creating a space where Bethel community members can engage in intentional prayer. Beginning March 30, and running through the month of April, there will be a six-person tent set up on the green space in Kresge Courtyard, which lies in the middle of campus between the Wellness Center, Hagstrom Center, and Brushaber Commons. With that, the idea began to take shape and the specifics ironed out. The tent will be stocked with seating and lighting, a mat for kneeling, a desk with journaling paper, and pens. There will be a board on which community members—or those who come to pray—can post prayer requests, photos, or responses. The hope is that every minute of every day, someone will be present in the tent and praying for the Bethel community. The rest, says Anderson, will be largely up to the Holy Spirit. Student-led groups like Pray First meet regularly to intercede for campus worship gatherings, staff and faculty, and even to walk through residence halls emptying students’ trash cans and offering to pray for them. CityFront is another student group that travels to spots in Minneapolis, handing out free food, talking with people, and praying with them. Every group is supported by an on-campus prayer team that prays specifically for that group’s conversations. “God is calling us back to the basics…he wants us to encounter him through prayer. It’s exciting!” says Johnson. Bethel students, staff, and faculty who are interested in signing up to pray in the Prayer Tent can sign up online. Wider community members are welcome to pray from afar, or are encouraged to sign up for the National Prayer Initiative to receive monthly prayer requests from Bethel.